The bark-like skin of yam is definitely not an aesthetically appealing food. However it has a myriad of health benefits. Today's recipe "Pidi Karunai Masiyal" is with a yam variety which is often overlooked primarily for its skin and the mild bleach smell which comes while cooking. 1. Soak the yam in water for a minimum of 30 minutes and add tamarind to the recipe. If it is too itchy, soak the yam in tamarind water for a minimum of 30 minutes rather than plain water. In this case you need to discard the tamarind water as the dirt in the yam will be present in the tamarind water. 2. 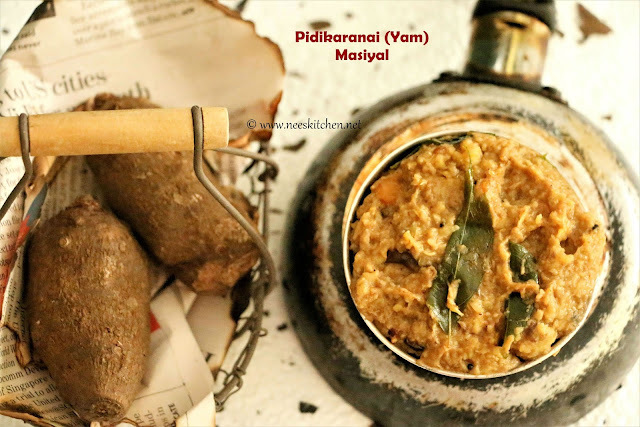 For pidi karunai, pressure cook (half-cook) with enough water and turmeric. Add tamarind water to the recipe. 1. 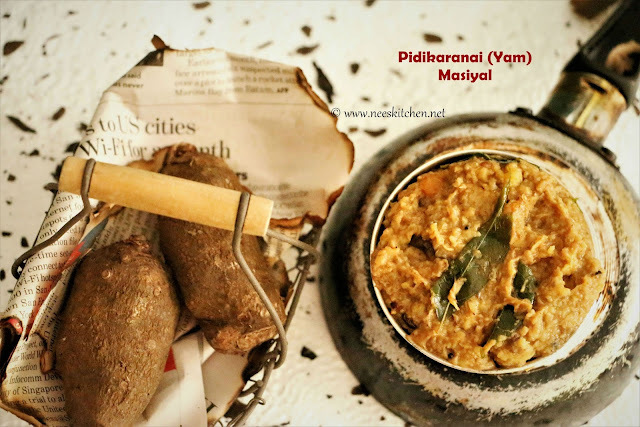 To begin making the Pidi karunai Masiyal, soak the yam in the water for a minimum of 30 minutes. This would help to remove the itchy sensation which is due to calcium oxide crystals present in the yam. Refer to the other methods mentioned above in my post if required. 2. In parallel, soak tamarind in 1 cup of water. 3. In the pressure cooker, place the pidi karunai (yam) by adding enough water to cover it. Add ½ tsp turmeric. Pressure cook upto 3 whistles. 5. 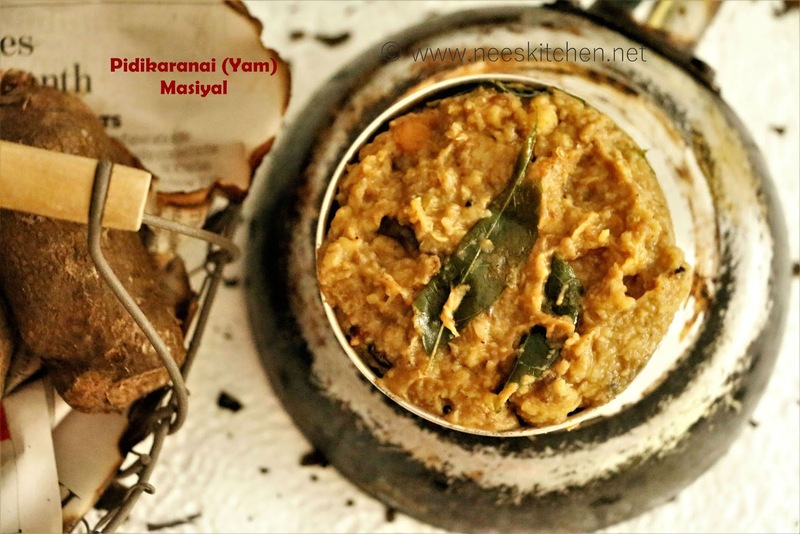 Mash the pidi karunai (yam) without any lumps and set aside. 6. Dilute the tamarind in water and set aside. 8. Add the tamarind pulp, curry leaves and 1 tsp of turmeric powder. Bring this to boil and cook until the rawness of the tamarind disappears. 9. Combine mashed pidi karunai with the tamrind and cook until the recipes becomes into a thick consistency. 10. Serve hot with white rice. 1. The time required to soak the yam in plain water can be increased. Make sure to remove the dirt before pressure cook.